The sport of white water river rafting calls for a triumph over the swift swirling river as it gushes past spectacular mountains. It is practiced mainly in the upper reaches where the water is wild and white as it froths & foams, crashing against narrow gorges, rocky outcrops and falls at deep gradients. As with trekking, mountaineering and other sports, river rafting too has been classified and graded in terms of degrees of difficulty. The river must first be carefully studied from the land route. 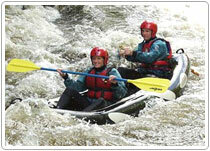 The equipment for white water river rafting is an oar-frame raft, which usually accommodates a maximum of eight persons. An experienced guide using two large oars navigates it. Sometimes all persons on board use paddle for greater power to match the river. However, keen coordination is necessary and it is important not to fight the current if adrift. The rafts have inflatable compartments with vulcanized rubber bodies reinforced by nylon fabric beneath an exterior of neoprene. This degree of strength for the raft is necessary for It to tolerate battering by waves and rocks. Generally, the greater the drop in gradient and the narrower the gorge being negotiated, the smaller would be the viable raft size. Provisions are carried on board. In order that the maximum enjoyment be derived from river running, particularly on white water, it is essential that safety measures be taken. Primarily, the helmsman on board should be familiar with the topography of the river and its obstacles. Life jackets and crash helmets should be worn by all with back up arrangements for rescue, evacuation and medical attention on the riverbank. Most important of all, the guide should be suitably qualified so that panic is avoided if there is a mishap.